For about two years now I’ve been trying to declutter and minimise my possessions. Sometimes that entails throwing out old sketchbooks – after ripping out the pages I want to keep in my portfolio. While I always try to draw or paint to the best of my current abilities, over the years as my abilities progress (thankfully!) I am able to make clearer-headed decisions about what to keep. The rest I think of as good practice. I wanted to share some art works I found while decluttering old sketchbooks, and will do so over a series of posts on here. All of them were photographed on a Nikon D90 camera. Due to their large size I was unable to fit them onto my scanner! In addition to that, we recently changed to a new photographic software programme on the computer and I haven’t yet learned how to stitch together multiple scanner files (I’m better at the drawing end than the agonising post-production process, anyway!). 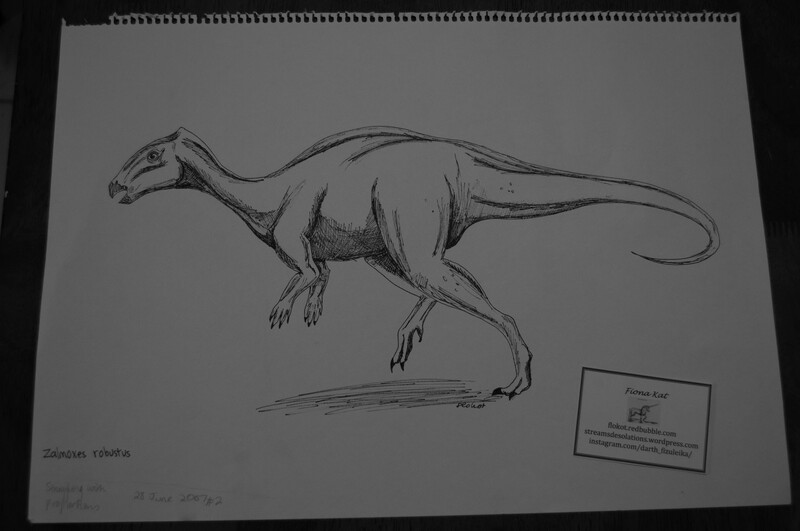 A 2007 ink fineliner sketch inspired by the Romanian dinosaur genus Zalmoxes. Posted in art and tagged animals, art, decluttering, dinosaur, drawing, fineliner, ink, paleoart, sketchbook, sketching, Zalmoxes on July 7, 2015 by Fiona.